When Obsessive Compulsive Cosmetics first introduced their All-Star Mini Lip Tar Sets I was checking Sephora every day for the chance to snag them. I've wanted Lip Tars for such a long time but the sizes were intimidating. The chance of an average person finishing a regular sized tube is slim, so I was glad they came out with miniature sizes! 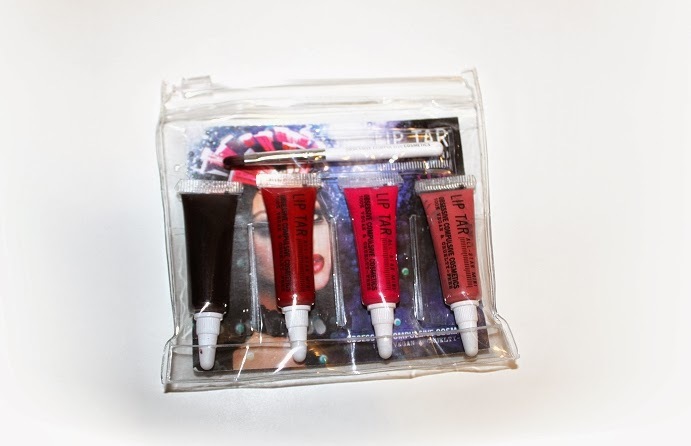 The Lip Tar All-Star Mini x4 Set retails for $20 USD ($34 CAD) and includes a short-handled synthetic brush and 4 of OCC's Lip Tar All-Star Mini (0.08 oz) which is significantly a lot less than a regular size tube (0.28 less!) -- with that said, in this set they would individually cost about $5 each. * Memento is described as a pink plum neutral. * NSFW is described as a primary red. * Anime is described as a vibrant neon pink. * Black Dahlia is described as a blackened red. 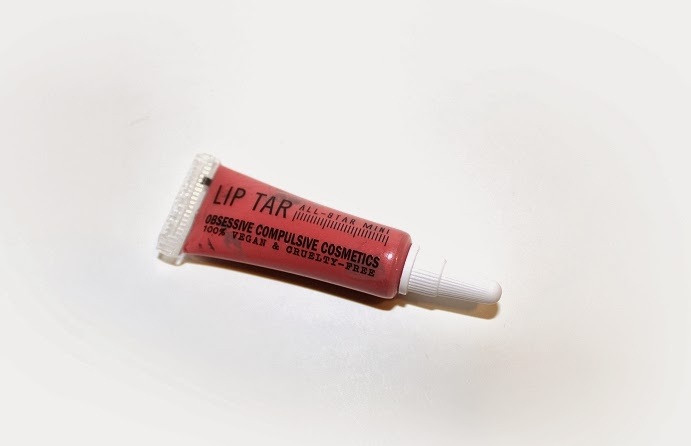 The packaging for Lip Tars is very simple, which is nice. Like all others, these have the same mint scent/flavor to them. A little product goes a long way, you only need a pea sized amount for your entire mouth. If you apply too much it may leave your lips feathering and looking like a pound of gloss was applied to your face. The formula is smooth, non-sticky and can give your lips a moisturizing feeling while wearing, however your lips are left feeling dry once the product disappears. With that said, some colors can be staining which is nice for when the product does wear away, you can throw on some chap stick and still have a subtle lip color. * The product does separate over time but it's an easy fix. All you need to do is flip the tube on its other side and it'll mix itself back together! My only complaint, as well as many others, is that my Anime and Black Dahlia were only half full! Especially since you're getting such a significant amount less than the regular sized tube, I feel a little ripped off. Personally, I'm not a huge fan of mint lip products either. Overall, the mini sizes are a great idea. You may actually see the end of a tube (especially if you get a half full one...) A little product goes a long way, so I can see these little buddies lasting me quite some time. 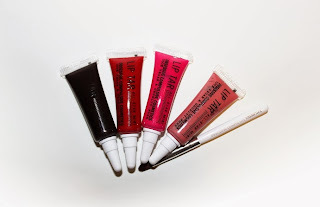 Obsessive Compulsive Cosmetic Lip Tars are a really great product, if you have the chance to pick this set up I'd recommend you do! 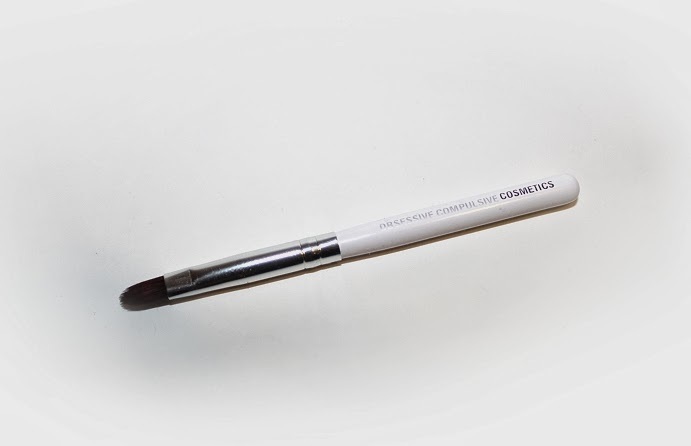 Can be purchased from Sephora Online, Sephora Stores and OCC Online for $20 USD ($34 CAD).